Protein PD-1 (programmed death-1, also known as CD279, gene name PDCD1) is a 55 KDa member of the immunoglobulin superfamily. It contains the immunoreceptor tyrosine-based inhibitory motif (ITIM) and plays a key role in peripheral tolerance and autoimmune disease. 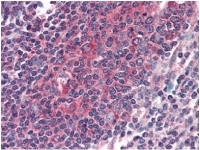 PD-1 is expressed predominantly on activated T and B lymphocytes. Two members of the B7 family have been identified as the PD-1 ligands, PD-L1 (B7-H1, CD274) and PD-L2 (B7-DC, CD273). Evidence reported to date suggests overlapping functions for these two PD-1 ligands and their constitutive expression on some normal tissues and upregulation on activated antigen-presenting cells. PD-L1 (B7H1), a member of the B7 family, has a predicted molecular weight of approximately 40 kDa and belongs to the Ig superfamily. 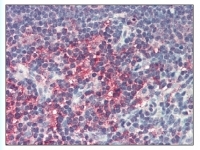 PD-L1 is expressed on a majority of leukocytes. Interaction of PD-1 with either PDL1 or PDL2 results in inhibition of T and B cell responses. PD-L2 (B7DC) a recently identified member of the B7 family, has a predicted molecular weight of approximately 25 kDa and it also belongs to the Ig superfamily. PD-L2 is primarily expressed by subpopulations of dendritic cells and monocytes/macrophages. Although PD-L2 has structural and sequence similarities to the B7 family, it does not bind CD28/CTLA-4, rather it is a ligand for PD-1. The interactions between PD-1 and B7-DC/PD-L2 have been reported to be involved in costimulation or suppression of T cell proliferation depending on state of cellular activation. Fig. 1: AP07695PU-NCD274 antibody staining of Formalin-Fixed Paraffin-Embedded Human Thymus. Fig. 2: AP07336PU-NPDCD1 antibody staining of Formalin-Fixed Paraffin-Embedded Human Small Intestine. Fig. 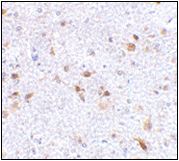 3: Immunohistochemistry of PDL-2 in mouse brain tissue with AP30656PU-N at 2.5 μg/ml.